I have to admit that since we don’t get a very bright-colored group of birds, I prefer the little hummingbirds. They visit our area between March and October. I know I went overboard, but I actually had four hummingbird feeders placed around the yard. I knew that hummingbirds tend to be territorial, so was hoping we would be able to accommodate a few of them at any given time. Well, we no longer have four hummingbird feeders! Last week, I was quite surprised to find all four of the feeders totally dry, and one of them actually sitting in the middle of the yard, flipped over. I looked at our neighbors’ hummingbird feeder, and sure enough, it was also pulled down off its hook. We have lived in this area for twenty years, and none of us have ever seen a raccoon…. ever! Those little critters are mighty handy… I cannot believe they were able to climb up the poles and get the nectar out of those little holes in the hummingbird feeders by tipping them just right, but they were. I had no idea raccoons are that stealthy, but rather doubt the little squirrels could pull off this feat. Live and learn! One visit to our local Wild Birds Unlimited store took care of this little “problem”>>> I am down to only two hummingbird feeders on one pole, complete with a squirrel baffle. While I enjoy our birds and some of the squirrels, nightly raccoons are simply not on our agenda! Thanks for the info! Mom hasn’t had this problem but I know there are raccoons around. She fills her feeders just after sunup and they are usually empty by early evening, there are so many hummingbirds around, and I guess the raccoons don’t mess with the empty feeders???? She’s found them messing with the seed feeders at nighttime, though. Danna where I live we have raccoons and oppossums as well. The only thing is, tell your neighbors if they have petdoors to leave them closed at night. One neighbor of ours woke up to a disturbance and went in her kitchen and here was a raccoon eating the dry cat food. She turned around slowly and got out of there. I normally see them in the early morning hours from 2 to 5 when up to take a potty break. Also oppossums are attracted to dogfood and catfood that is left outside at night. Once they find a good spot they keep coming back. My aunt has outside cats and she had a oppossum on her porch eating the catfood. Oh my goodness, Alfred! 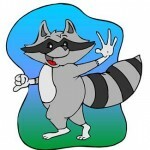 I had never thought about raccoons coming inside a house through a pet door. YUCK! Some of my neighbors feed feral cats, which must attract other types of animals, as well. As for opossums, there’s another YUCK! Years ago, when I had to be at work at 6a.m. I would get up early because I had at least a 30 minute drive. One summer I had a very big raccoon living in the sewer across the street from our house. Several mornings that darn raccoon would charge across the street at me whenever I tried to go outside to get into my car. This critter scared the daylights out of me. I finally made my hubby get up and walk outside with me to chase the raccoon away. One day we had a very sudden thunder storm that dumped quite a few inches of water on us. The rain came down so hard that it backed up in the sewer causing a flood. Lo and behold, here comes that raccoon with 3 little babies out of that sewer! I supposed this was why she was charging me, trying to protect her young ones. Little did she know that I was more afraid of her than her me! Little did she know that I wasn’t about to go anywhere near her or her kiddies!! After that we complained to our city wildlife people to help us with the situation. But the city people said that as long as there were babies they couldn’t do anything about the critters. The heck with me being scared half to death. Evidently these critters went somewhere else because I never saw them again. What kind of mother raises her kids in a sewer!! Linda C, I don’t blame you for being upset about that charging raccoon. Their claws and teeth are strong enough to do major damage to heavy-duty plastic trash containers. As cute as “our” baby squirrels are, I don’t want them in our yard! Unfortunately, they have grown accustomed to our bird seed, and seem to be bringing all of their relatives to picnic under our bird feeder. We didn’t see raccoons until last year. And I tell you what, one of those things came on the porch one night and it was HUGE. I think it must have crossed with a coyote somewhere along the line. It was trying to get in our cat door (inside door was closed) and it would NEVER have fit. I could just see us trying to get animal control over to pry a half-in/half-out raccoon out of our back door. Maria, raccoons are truly scary, aren’t they? No wonder Scamper likes to come inside! I put up my first Hummingbird feeder last year. My parents always get them but I never saw any around my house. Last year I was sitting outside in the evening and heard what I thought was an extremely large BEE buzzing around next to my ear. I jumped a mile and then I turned my head and it was a Hummingbird. I put a second feeder out this year but have not seen them yet. Last summer we went to Weston, Vermont for a few days to visit the Vermont Country Store and the Inn had a feeder outside our window, we must have counted 10 Hummingbirds. They were amazing! Margaret, when my husband and I lived in Panama, we would get a lot of Hummingbirds at our feeders. There didn’t seem to be a territorial thing going there. Here, however, they spend more time running other Hummingbirds off than they do eating! Last year bees discovered our feeders, which was a huge drag, until I tried something I saw on the internet. If bees are at a feeder, all you have to do is move it about five feet, and they aren’t able to tell where it is. I had to move it a few times last summer, because, eventually, the scouts would find them. I hope you get a lot of Hummingbirds at your feeder this summer! Danna quick note on the Hummingbirds. I wonder who makes their own syrup for the feeders. I read somewhere if you use the red stuff in the stores it does something to there senses – can’t remember just what right now. We always make are own with 4 cups of water to 1 cup sugar. Also if you put in hot water in the pan instead, it boils quicker than waiting for the cold to heat up. Alfred, I heard about the red dye in hummingbird feeders years ago. I’m not sure if there is any evidence of it being a problem, but I still don’t use it>>> just to be safe. I just made a fresh batch of nectar yesterday. Now that I have that squirrel baffler on the pole, I don’t have to take the feeders down at night. After a week of that, I was ready to stop feeding the little guys at all. I tried the hummingbird feeders one year and all I got was a bunch of ants. But I then tried to plant flowers that attracted the hummingbirds and butterflies and was very sucessful. Love those little birds, reminds me of Tinkerbell. There you go, Linda C. It turned into a win-win event… not only did you get hummingbirds and butterflies, but you also got beautiful flowered plants. Tomorrow being the first day of summer I have been saving Dorothea Benton Frank’s newest book “Folly Beach.” This is one of my absolutely favorite all time series, especially for summer reading. Why I am attracked to books that are set in South Carolina is a mystery in itself, to me anyway. But I love books that are set in that state, maybe because that is one of those states that I want to visit some time. I think I bought this book some time during the winter but I knew I didn’t want to read it until summer. Well, tomorrow is summer!! I intend to get up early with a good cup of coffee, sit outside, read until it gets too hot then come inside and then sometime during the middle of the afternoon get myself out a couple of wine coolers and enjoy this book! My hubby is on his own for meals tomorrow. I might feed my dogs!! I haven’t been reading just too many cozy mysteries because I had gotten hooked on the Cedar Cove series by Debbie Macomber. After I finished reading that series I read Emilie Richards’ book “Sunset Beach,” which is a great summer type reading book. After that I read Kristin Hannah’s “Night Road,” which is another great, great book! This book should be required reading for all kids who party then drink and drive. Another series of books I am reading is Luanne Rice’s series “Summer Child” and then “Summer of Roses.” I seem to remember the first book in this particular series but I can’t remember the title. I went to the library today and picked up several more books by Luanne Rice that had some sort of beach on the front covers. I have more or less caught up on the Cozies that I have found in the libraires. But I love this type of reading just as much as I do the cozy mysteries. So you see Danna, there are just too many, many really good books that are available for people to read without spending very much time on ones that we don’t like. Someone said they would read 100 pages and then if she wasn’t interested by then she gave it up. I would say she is really giving this book a good try. More of a try than I would have! I give that person thumbs up today. She is a lot braver than I am and she sure does have a lot more more patience (close enough) than I do! Happy Summer and happy summer reading everyone! Linda C, is it summer already? (Actually, this morning it surely felt like it is!) Your description of your summer reading list looks really good to me, except, I might just start reading books that take place when it’s cold>>> It’s only 85* here in San Antonio today (with 67% humidity) and looks like it will be 100* (with 75% humidity) on Saturday. Maybe reading about a sleuth who is sitting by a fireside is exactly what I will need this summer! I did something I said I would never do: I read a Halloween mystery a few weeks ago. I took some of “you all’s” advice (I doubt that’s the way to say it, but I couldn’t figure out how) from a previous post, and decided to break my rule about reading holiday-themed Cozy Mystery books only during the appropriate holiday seasons. I am quite glad I finally tried doing this. I read a Halloween mystery (by Monica Ferris), and loved that it was cold outside in the book! Danna, I did read “Folly Beach” yesterday and it was a very good book. But I learned something while reading this book. I had saved this book because I wanted a ‘summer’ type book to read on the first day of summer. This book takes place in February! What a surprise for me! The next time I think I am going save a book that I think is taking place during a certain time of year, or during any paticular season, I just might go ahead and read the book. Here I kept this book to read on the first day of summer, thinking it was a summer type book and it takes place in the middle of winter! I think from now on when one of my favorites has a new release, regardless of the time of year, I will just read the thing. This book, although a very good one, isn’t really about Folly Beach. It is about how “Porgy and Bess” came to be. Really good book though, some insights into Charleston, S.C. and some insights into the white/black situation in South Carolina during that time period, well as some insight into the love of a woman for her husband. Lots of insight into George Gershwin, also. Really good book to read during February,!! Linda C, if you had a memory as bad as mine is sometimes proving to be, you could probably read Folly Beach again in February. More than likely I could read this book again in Feb, and not remember it..Why did God give me a brain?? I know it’s been over a year since you posted this, but I was wondering how things have been going with the raccoons. I had the same problem and couldn’t figure out what critter was knocking the feeders down, but a couple of nights ago my dog streaked out the back door barking and snarling. I slipped my shoes on and grabbed a flashlight and there was my dog, barking at a very unhappy raccoon who was cornered in the fence, standing on his back feet trying to swipe at my dog. I distracted my dog long enough for the raccoon to scale my 6ft fence. Now I have to bring my feeders in overnight which I hate to do because the hummers come out early in the morning (earlier than me). So I was interested to know how things were going in your yard. Robert, we bought these squirrel baffles, and haven’t had any problems with the raccoons since then. (This is assuming you have your feeders hanging off of a pole.) You can probably find them at Lowe’s or Home Depot. At first it was sort of sad to see the squirrels try to go up the poles, but once they learned they couldn’t, they didn’t try anymore. I found this helpful. I think one of the raccoons living nearby climbed into the back of my building, came up the stairs, and drank the hummingbird sugar water I had cooling in a pot outside last night. I make my own solution with organic cane sugar and white sugar. I had two cups cooling in the pot. It wasn’t tipped over, but there was some dirt in the tiny bit left. I think my cat saw it happen. I didn’t think raccoons had a sweet tooth.